One of my favorite memories as a child was seeing Santa at Macy’s, Harald Square in NYC. I also remember walking out the circular door and wondering what was up with the Santa ringing a bell? He of course was not the “real” Santa, my mother explained. With that memory blazing in my mind we made plans to be in NYC in December. Thanks to my brother and sister-in-law we met them and stayed at The Pulse in NYC. Located at 33 West 37th our room and the rooftop bar both have an incredible view of the Empire State Bldg. The Giants lost to Dallas the night we first arrived but the Empire State Building still welcomed us with Big Blue lights. This is a perfect location for all we wanted to cram into our two nights in The City. We arrived mid afternoon and checked in and then headed to an Irish pub, The Keg Room for a beer and to watch the Giants lose again. Just not our year! But what Giant fan doesn’t want to watch a game in an Irish Pub when they are in NYC. By the time the game was over we were able to get settled in our hotel, then change and head out to see the lights. The problem was everyone else had the same idea. We headed down 5th Avenue and the crowds were so immense that we were shoulder to shoulder, at times moving as one large mass. 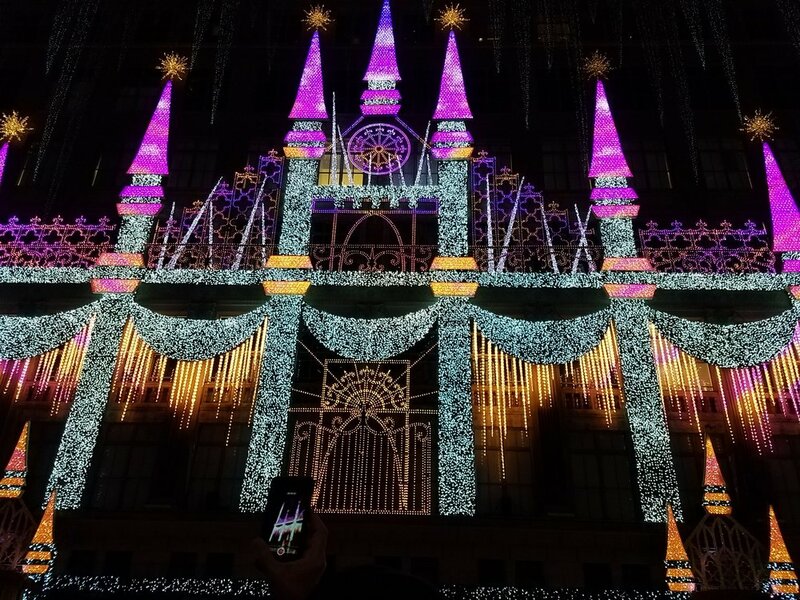 By the time we got to Saks the crowds were too large to get over to see the windows. Rockefeller Center was nearly as crowded, but we did get to see the skaters and tree. We wandered some more, all the way to Central Park, then back around Radio City and had dinner just off of Time Square at Heartland Brewery. We picked the perfect spot as it had something for everyone - pasta, burgers and even perfectly seared tuna. Back to the hotel for a nightcap at the rooftop bar, The Top of the Strand. The next morning, I was lying in bed thinking how quiet this hotel room was for being right in the middle of everything, and just then the sirens started. That morning New York’s finest were on their game and apprehended a terrorist at the subway station just down the street. That station remained closed for the remainder of the day, but the city was quickly back on schedule, people were re-routed and it was business as usual. YES! That’s New York for you. We got up and headed to grab a light bite for breakfast; I was saving my calories for Katz’s deli for lunch. With coffee and a croissant out of the way, we were off to see the sites. My brother did a great job of putting together an agenda for us. First stop was The High Line, Mike was excited to get a chance to see this area that he had read so much about. The High Line is a public park built on the old freight rails on Manhattan’s West Side. It is a great place to walk, the views are great, it is nice to be up high and the local artists have some wonderful pieces on display. We ended our walk at Chelsea Market Shops which was the perfect spot to warm up after our walk. I love to visit markets wherever I travel, and Chelsea was even more beautiful decked out in Christmas décor. The smells, the colors, the people and the diversity of shops makes this a wonderful market. Next stop was the 911 Memorial Museum https://www.911memorial.org/ . We hopped on the subway and headed over to The World Trade Center https://wtc.com/ one of the most incredible spots for seeing truly amazing and diverse architecture. In such a small space you will find amazing buildings that span hundreds of years, and now it is such a hallowed place for all of us. They did a beautiful job with the Memorial. It’s a difficult balance to reach, one that shows respect and educates, but doesn’t over-step the fact that this is the final resting place for so many. Hungry and ready to EAT – back on the subway and off to Katz’s Deli. Everyone knows you can’t get good Deli food anywhere else. I spent years eating in some of the best Delis in LA and the San Fernando Valley, but still they were in California. Some say the water isn’t the same, others blame it on the weather. 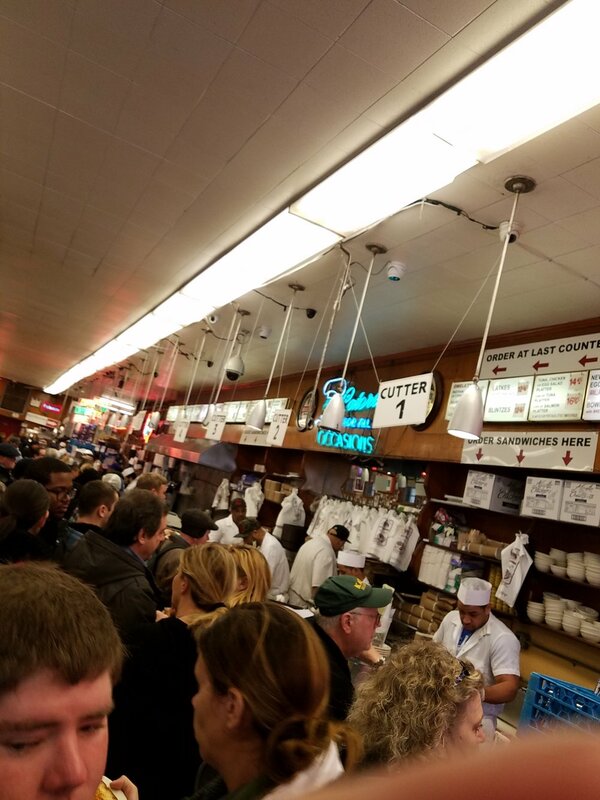 If you are a seasoned visitor to Katz’s you just stroll in, stand in line and place your order. But we chose to take a number and wait to be seated, and have a waiter help us. It was so worth the wait and as soon as we sat down they arrived with pickles for the table. Bren had the matzo ball soup and half a sandwich which was amazing. I had the Reuben with a chocolate egg cream, another childhood memory. Mike and Butch had pastrami, so Mike and I split halves, so we could enjoy both. We all split a square potato knish because I just had to have one, and there was no way I had room for that too. I now know I can order the pastrami and have it delivered to my door! Full and ready to walk off our huge lunch we headed back to the subway and went to Herald Square to see Santa! Nope we couldn’t see him. 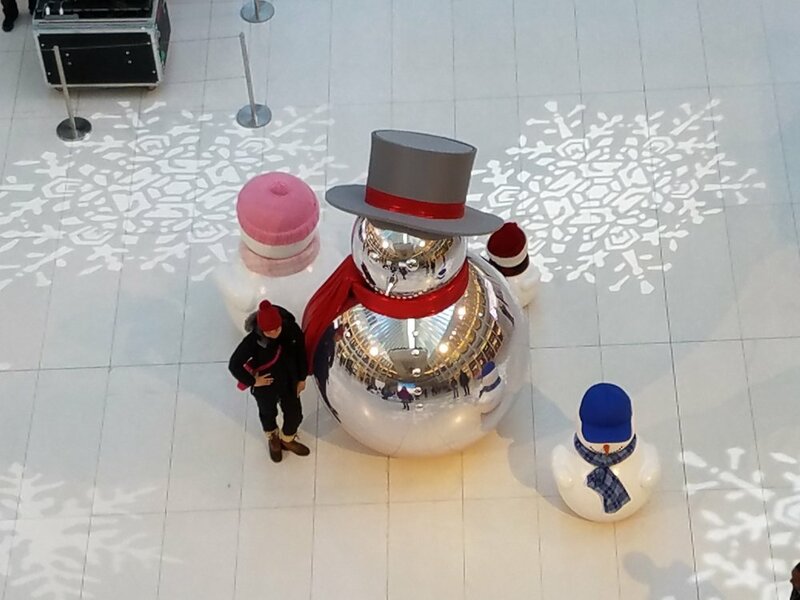 Macy’s has now hidden him behind a wall, guarded by lots of Elves and Santa’s Helpers. You need an appointment, and without one you don’t even get a peek. OK that memory remains unchanged. But I still loved wandering through Macy’s and taking their old escalators. They still have the original wooden ones. Quick stop at the children’s department to get a few gifts for the grands and we were off to The View at the Marriott Marquis. On our way to The View we wandered down 5th Avenue to see if the crowds had thinned. They had, and we got to see all Sak’s windows and drop in for another visit to Rockefeller Square. 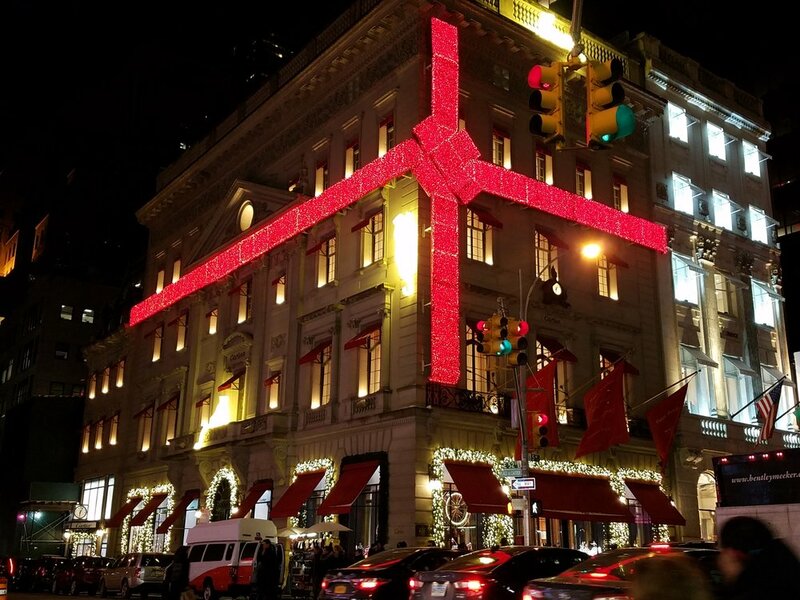 There really is nothing quite like NYC at Christmas. Ready to sit, we went up to the The View lounge, which revolves and is located on the 48th floor. The ride up on the elevator is a fun little rush. It takes about an hour for the restaurant to spin 360 degrees. Be aware if you order drinks that two club sodas cost $12.00 😊. If we go back, we may have to add the buffet to our plans. There was a gentleman near us who visited it 3 or 4 times and made sure he made room for about 4 chocolate treats! He certainly got his money’s worth. After a full day of walking, we were ready to go back to our hotel. We settled for salads and dessert at The Strand Bistro in the hotel. It was quiet, cozy and just the right place to end the day. On our last morning, we headed to The Herald, an American Bistro right on Herald Square. It was fabulous. We sat upstairs, and the walls had old suitcases hanging. Everyone found something they enjoyed: French toast, blueberry pancakes, eggs with chorizo and huevos rancheros with black beans. Time for one more walk around the city, over to Gramercy Park, then back to check out and head for the airport, where I made sure I had a slice of NY Pizza. That is usually the first thing I do, but you can’t leave NYC without a slice.